1. Netivot HaShalom, by Rabbi Moshe Nehemiya Kohanov. Printed by Yoel Moshe Salomon, Jerusalem 1875. 2. Mishkenot L’Abir Yaakov, by Rabbi Hillel Moshe Meshil of Bialystock. Jerusalem, without the name, location and year of printing. 3. Orech Ne’eman, by Rabbi Menachem Natan Auerbach. Salomon printing, Jerusalem 1924. 4. Olat Ish by Rabbi Shaul Alisher. Zuckerman printing, Jerusalem 1899. 5. 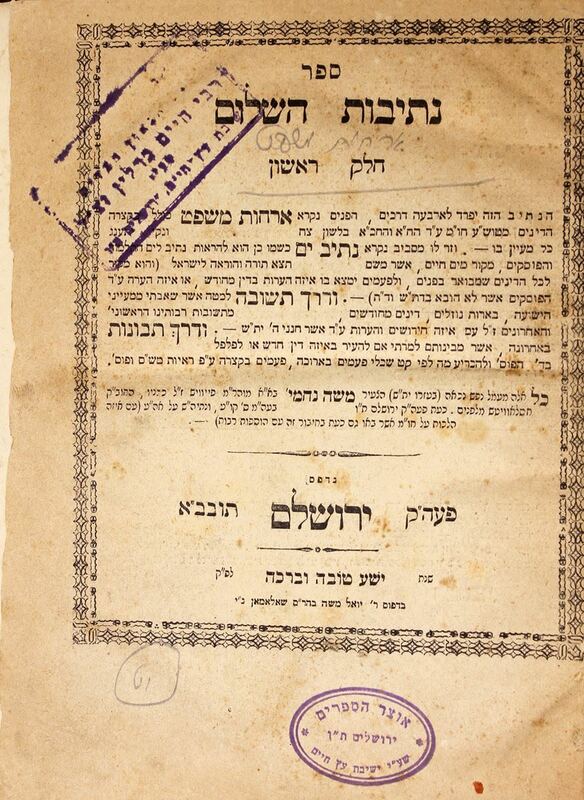 Mas’at Yaakov, by Rabbi Avraham Zvi Priloker, printed by Zikaron Shlomo, Jerusalem 1891 6. Orech Ne’eman, fourth section, by Rabbi Menachem Natan Auerbach. Salomon printing, Jerusalem 1931. 7. Imrei Bina, first section, by Rabbi Meir Auerbach. Printed by Yoel Moshe Salomon, Jerusalem 1876. 8. Two copies of Imrei Bina, second section, by Rabbi Meir Auerbach. Printed by Yoel Moshe Salomon, Jerusalem 1876 9. Sha’arei Rachamim by Rabbi Rachamim Franco. Gashtzinni printing, Jerusalem 1881. 10. Sukkat Shalom by Rabbi Shalom Mizrahi Adani. Zikaron Shlomo printing, Jerusalem 1891. 11. Rishon LeZiyyon by Rabbi Haim ben Atar. Levi printing, Jerusalem 1915 Many of the books are stamped by the Gaon Rabbi Haim Berlin, son of the Natziv of Volozhin (see about him in other items from this catalogue. Different sizes and conditions, generally ok to good condition.